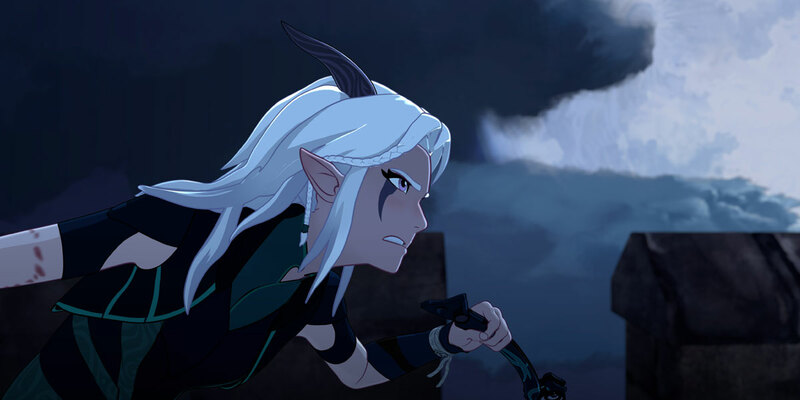 Hypable speaks with the minds behind Netflix’s new animated series The Dragon Prince, previewing exciting character choices, crucial themes, and what really is a bad guy, anyway? 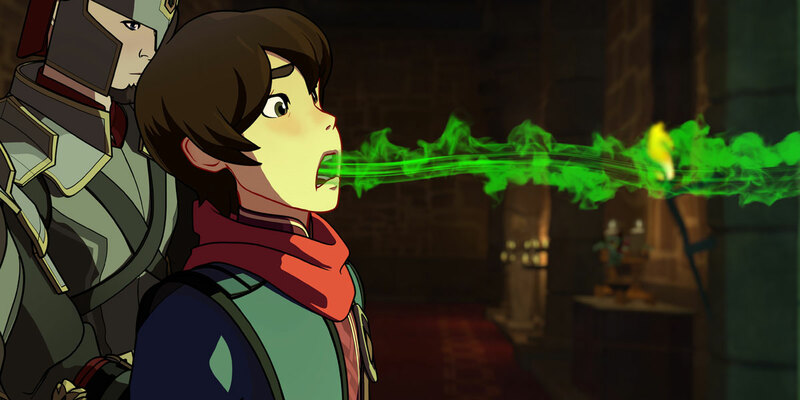 The Dragon Prince comes from the new entertainment venture Wonderstorm, and is created by Aaron Ehasz, Justin Richmond, and Giancarlo Volpe. Set in a world where magic is drawn from six elemental sources and kingdoms are dominated by powerful dragons and elves, The Dragon Prince follows two human princes and the elven assassin sent to kill them, as they seek to right the wrongs committed by the very people they love most. 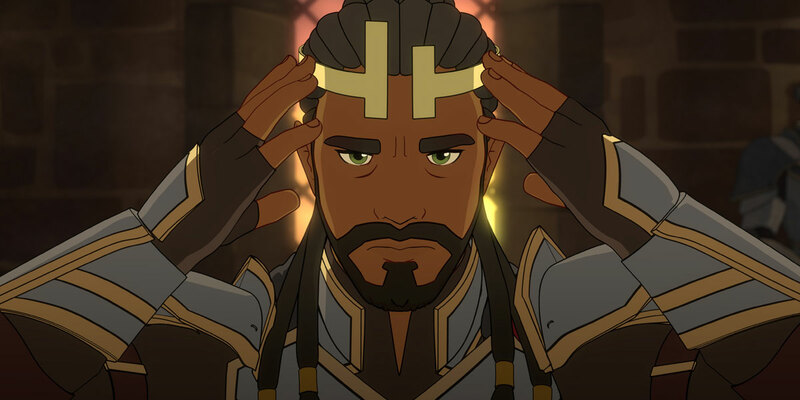 Warning: There will be mild spoilers for the first three episodes of The Dragon Prince season 1 below. 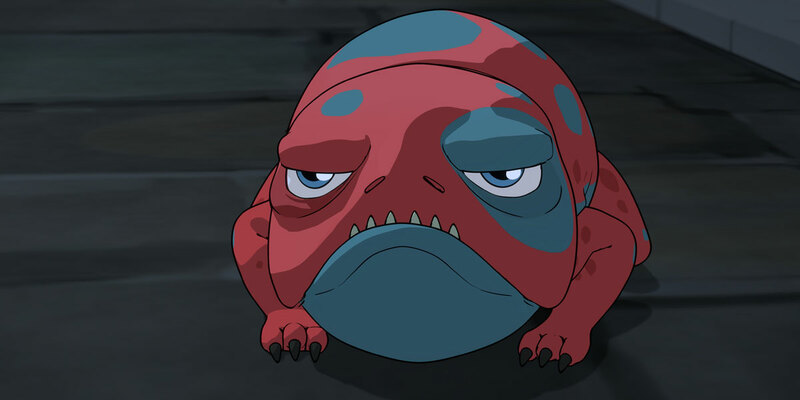 In the first 30 minutes of ‘The Dragon Prince’ we have two conversations about the nature of cyclical violence and revenge, and there were also so many other themes introduced. How did you guys approach the thematic structure of the show? Were those ideas you wanted to include in a story, or did you build the story and then develop those themes later? Aaron Ehasz: First of all I noticed, I think, in your [review], you said something like “themes up to your eyeballs.” We were laughing about that. For me, I think that theme is something that you don’t want to cram in there. But it is part of what connects the characters and their experience, and their story, to an audience in terms of being meaningful. So it is something we did think about. Specifically, in terms of the cycles of violence, at the time Justin [Richmond] and I were thinking about the story and building this epic world, I think we were thinking a lot about how conflicts are passed down among peoples, from generation to generation. New generations kind of take up the conflict, the crimes, that their parents’ generation have committed against each other. And we were really interested in the idea of a young person who is coming of age, and starting to make decisions and look at the world, why do they take that on? Why do they take on the burdens of those conflicts? Why can’t they make a different choice? And we didn’t want to just say, well okay, they’re going to make a different choice, and here we go, these kids are going to do things differently, and be friends instead of fighting. We want them to feel the weight of those past generations, and struggle with that, and hopefully confront it and hopefully change. We do believe that there’s an opportunity, especially for young people, to look at their world, to look at what they’re being told, and make decisions that come up with a brighter future. 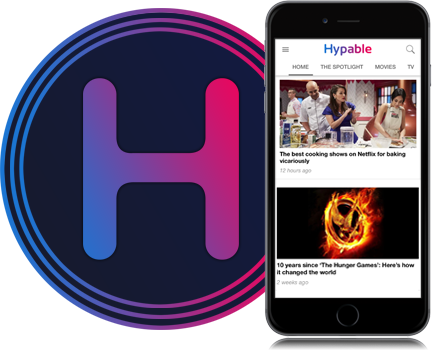 It was something that we were just really interested in, and thought would be an awesome part of an epic story, but that also would mean something and be relevant to real people in the world today. We sort of noticed that you forgot to make a villain. Everyone is kind of good, in their own way, trying to do what they believe is the right thing. So, how did you approach that? And will we be seeing characters take on a more traditionally antagonist role, or is this something you want to keep up throughout the entire series? Justin Richmond: I think the most interesting villains oftentimes don’t know that they’re villains, or don’t think that they’re villains. There’s definitely right and wrong in this world, in Xadia, but people approach it through different lenses. What they use to justify it to themselves, and to their people, may be different than what the next generation sees, like Aaron [Ehasz] was talking about before. And so I think that’s just something that’s very compelling. As the series goes on, people will go in different directions, and maybe not the direction that you’re expecting them to go in. So, hopefully we are able to surprise you, but not surprises that come out of left field, but that you’ll see in their character that that’s been in their journey all along, and the choices they make are what make them interesting to begin with. At the end of the third episode, we have Callum, Rayla and Ezran heading off on an adventure together. Are they going to be the three amigos? 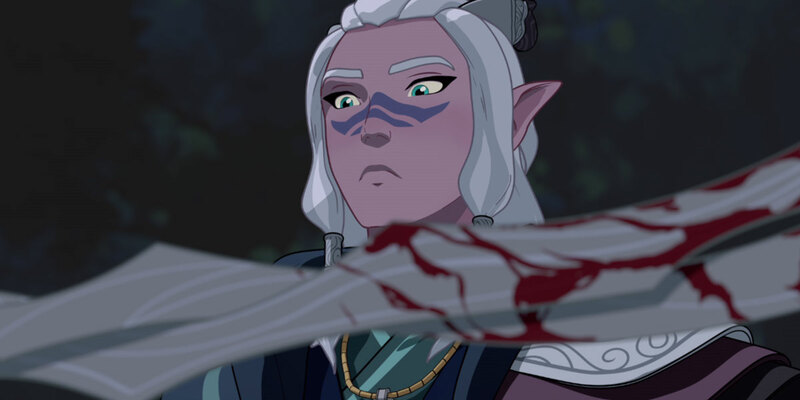 Or will we see a little more conflict developing there, especially considering what Rayla seemingly knows about the fate of one of the characters? Giancarlo Volpe: You will find in upcoming episodes that they’re not immediately a team with 100% trust in each other. I think that that speaks to what Aaron was saying earlier, there’s still this backstory and history for both sides, and that causes mistrust. So, yeah. It’s definitely complicated. They’re not the wonder trio immediately. But there’s still little elements of that. They do clearly have chemistry. Speaking of chemistry, Callum and Claudia shared a few sweet moments within the first few episodes, but it’s hard to know where that’s going to go now, following the events of the third episode. In terms of any potential relationships, did you have any in mind from the inception of the show? Aaron Ehasz: We try to have an organic and natural approach to characters, and to the possibility that relationships might emerge. So we might have some sense of intrigue, or interest, at some point, but we’re going to follow their paths in a very natural way. And if it leads to things developing between characters, wonderful. If it leads other ways, then that’ll happen. I can already tell you that in the time we’ve worked on this story, the characters and their relationships have led us a slightly different way than we initially expected. So, I think not knowing, and just engaging with the characters, and following along with them day-to-day, is the best way to experience that. I hope the audience will join us for that journey. When it comes to Viren, he’s kind of like the Jafar of ‘The Dragon Prince’ world. He should seem like a really bad guy, but you can see that he is very close to Harrow, he has good intentions. It almost feels as though he’s willing to do terrible things, but only for good reasons. In respect to the way that impacts his children, Soren and Claudia, how is that family going to move forward, with Viren as the moral focal point? Aaron Ehasz: Viren has been a fascinating character. Quick shoutout to his voice actor, Jason Simpson, who brings such a layer of performance, and such complexity, that is has been a joy to think about that character, and what was possible, and the range of what could be going on. I think he’s a character that people are going to debate, and argue about. Is he evil? Is he really good? He’s so complicated. And the reality is he’s brilliant, he’s flawed, he loves, he cares. He’s just very complicated, and brilliant, I don’t know what else to say. He’s a lot of fun. There will be– I know you’ve seen the first few episodes, in the next six episodes you’re going to have some moments where you’re going to be like, wow, was I wrong about him? And then you’re gonna go, no, I’m not. He’s really compelling. We’re excited for the audience to have different opinions about him. What can you tell us about Callum’s journey? We have a lot of open questions about him in terms of his parentage. Why is he referred to as the step-prince, and why does everyone keep reminding him of that? Why does Viren call him a mongrel? As well as his magical ability, where that is coming from and how is it going to play into the rest of the series? He seems like a kid who hasn’t found his niche yet. Is that going to be part of his journey? Or are there other paths for him to take? Giancarlo Volpe: I think you’ve nailed it. He’s a kid who, like a lot of kids, has a lot of expectations on him. He’s in this position where his dad, or step-father, is the king, and there’s a certain set of expectations about being in court, being the step-son of a king and what does that mean? As he tries to do the best he can, with a lot of the things that are piled on him, he’s starting to realize that maybe that’s not the best path forward for him. Those aren’t the things he excels at. And there’s a complicated relationship between him and Harrow. Harrow’s had a hard time telling Callum things that maybe he should have said. In that scene with the letter, in [episode] two, you start to realize that maybe he should have been closer to Callum, and given him some of that advice. I think Callum is going to be more complicated than he first comes off. He’s got a big journey ahead of him. In general, yeah, he’s a really fascinating character, and as you learn more about him you’re on board for the ride of what he’s going to become, and the interesting things that he’s going to choose to do. Aaron Ehasz: I know you love themes. One of the themes that Callum carries for us is that destiny is a book you write yourself. To us, it’s a deeply epic, and deeply empowering theme. You create your own path, your own possibilities. You become the hero you want to become. But a part of getting to that is looking at the expectations others have for you, looking at the failures and shortcomings you see, and maybe those failures and shortcomings are actually just reflections of what other people are hoping for you. And once you see that you can choose your own path, and you follow that, that’s when you have a chance at really coming to that self-realization. That’s a theme, to me, that Callum connects to. And it’s not an easy journey. That’s a journey fraught with facing self-esteem issues, and confidence, and all kinds of things, and realizing that you are strong and amazing. That’s what Callum is about. So far in the show we have been introduced to two awesome female characters, but only two. Will there be more coming into play over the course of the series, and will we hear anything about the mysterious Moms? Giancarlo Volpe: There’s actually another female character in those first three episodes that has a bigger role later, that maybe you didn’t pick up on. And you hinted to more that will pay off, that you’ll learn about– I think in the very next episode, I hope this isn’t super spoilery, there’s a new female character that I think is super cool. She’s kind of a secret of ours that we can’t wait for the world to meet. I hope that you won’t be disappointed, there’s a lot more coming. 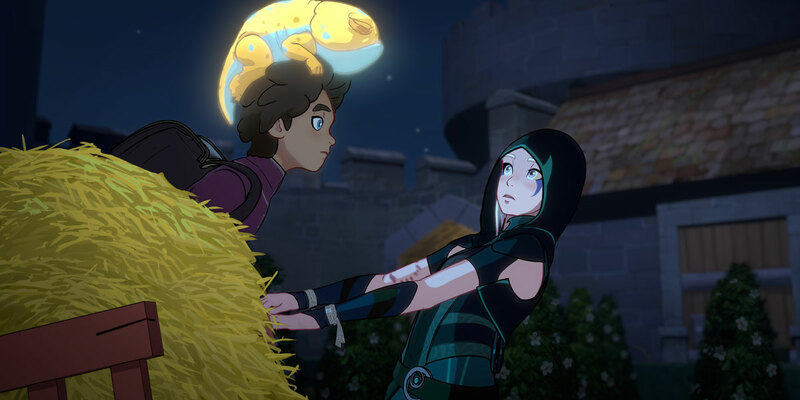 What can you tell us about the influences that ‘Avatar’ had on ‘The Dragon Prince’? Obviously there’s elemental sources of magic, and there’s also the book-style of naming your seasons. But beyond that, what influences did it have. Aaron Ehasz: First of all, I think the biggest influence was audience. Which is to say that the fan reaction to Avatar was so deep, and the noticing of so many details, and that– I don’t want to say obsession. That caring was so moving as a writer, and somebody that works on this stuff too, an audience can really connect with something. So the biggest influence was actually the audience. It was saying we want to do something again where the characters’ dimensions, where the details of the world, are worth of an audience that is going to pay attention to those details and dimensions. An audience that is intelligent, and is going to hopefully be passionate, and where the deeper they look, they find it’s worthy of their time and attention. For me, that was the core, number one, kind of north star, was make something for that intelligent, passionate audience. Giancarlo Volpe: I think one of the things that I, in hindsight, may have taken for granted on Avatar was the tone of the series. What I loved about that show was it was not afraid to tell a very dark or serious story, or have a scene that played out very mature, and then follow it up with a really whacky one, where the kids are doing something very fun and frivolous. And what I’ve found in my career since then, is that if I work on a show that is a little too much one or the other, I get a little antsy. Like I want to kind of switch between the two. So, what I think is working well on The Dragon Prince is it does that again. I think that speaks to Aaron’s writing sensibilities. I obviously kind of know what he means when he writes a scene, and I can interpret it fairly accurately, I guess. It’s just a fun world to play in, because I like that one day we can be noting up how to make a scene much funnier, and then all of a sudden how to make a scene much more tragic, for example. Aaron Ehasz: Part of the reason why Giancarlo was the dream director and showrunner for us, was because he’s the only guy I’ve ever worked with in my career who can nail it on all those fronts. On the action, the humor, the emotional scenes, and deliver something that’s cinematic and intimate. So I knew from the beginning, when Justin and I talked about it, if we could get Giancarlo to be a part of this that we could make this something that could deliver on all fronts. So we feel very lucky to be working together. Was there a moment in the writers room where you thought, ‘can we do this? Can we push this envelope?’ Is there anything that you really think will challenge the audience? Justin Richmond: I think there’s questions like that every day. Not so much like ‘are we going to push this boundary?’, but what is the right way to tell this story to have the most impact, that is deep and emotional, but not corny, or over the top, or gross, or whatever. So, I guess we’re always trying to be cognizant of our audience, and who’s watching it, and how people will perceive it. But there was definitely questions of how far can we go with some of this stuff that we do in the show. Never in terms of like, ‘oh, we’re not going to be able to do this because the network won’t let us.’ It was much more decisions around the best possible way to tell this, and how we’re going to push some of this stuff to get the impact we want. Since we’re assuming that the seasons correlate to the sources of magic, do you have six, or maybe seven, seasons planned out? Or ideas for that? Aaron Ehasz: Here’s the deal. We love this world. We have a lot of ideas for stories we can tell in this world. That said, we’re really proud of the story that we are telling with Netflix right now, and we’ll feel really happy if the audience receives that, and that’s that. But we hope that an audience finds this, and we’re able to tell much more of this story. And I know that’s not the 100% detailed version of the answer, but you can kind of read between the lines. We’d love to tell a very epic story here. And finally, when the Wonderstorm logo comes up at the end of episode 9, what feelings do you hope fans will have? Giancarlo Volpe: What feelings do we hope the fans have? At the very least, we hope that they want more. But also there should be a sense of satisfaction, and it’s not like an incomplete tale in any way. Aaron Ehasz: I always hope that people come away from stories like this feeling like, hey, the world can be hard, things can turn against you fast, and there are challenges. But there are true things like friendship, things that you can believe in, it’s worth hoping, it’s worth moving forward. And in the end, there are good people out there who you are going to find, you’re going to connect with, and you’re going to really change things with. I’m really, really a deep optimist, who believes a lot of hard things in the world, but there are other real optimists out there who face hard things together. So I hope people feel a little bit of that sense of that, if that’s not too much to ask for, basically. All nine episodes of The Dragon Prince will hit Netflix on Friday, Sept. 14.